Leipzig: Hermann Seemann Nachfolger, 1902. 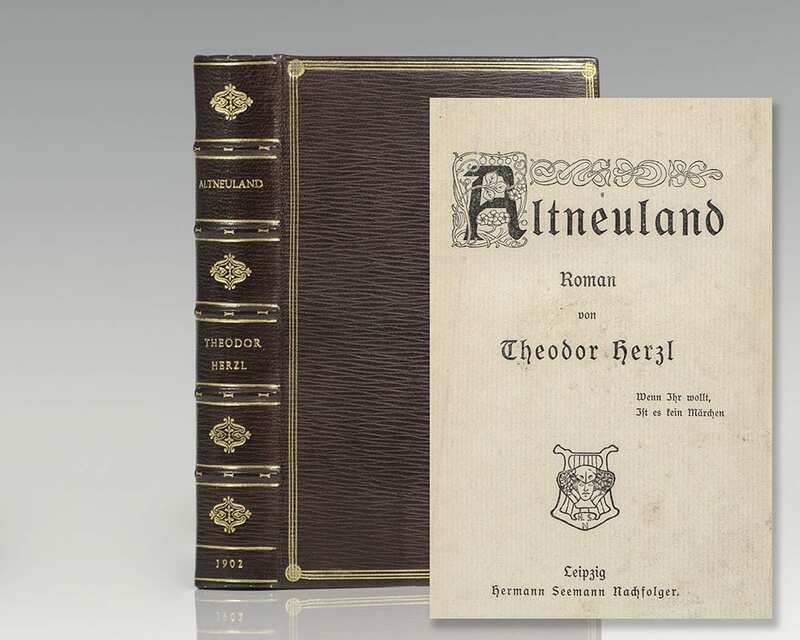 First edition of Herzl‘s Utopian novel in which he envisioned the social and cultural climate of a new Hebrew Nation. Octavo, bound in full morocco, gilt titles and tooling to the spine, raised bands, triple gilt ruled to the front and rear panel. In excellent condition, with the original front panel bound in at the rear. First editions are rare. 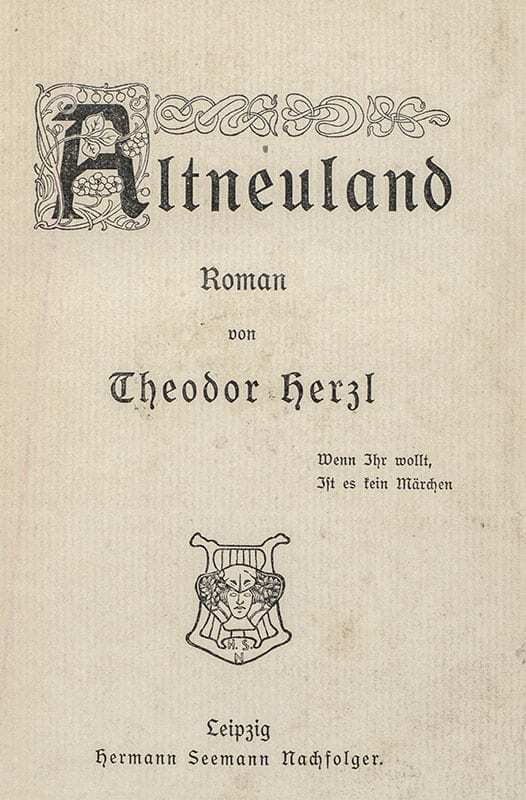 Old New-Land is a utopian novel published by Theodor Herzl. 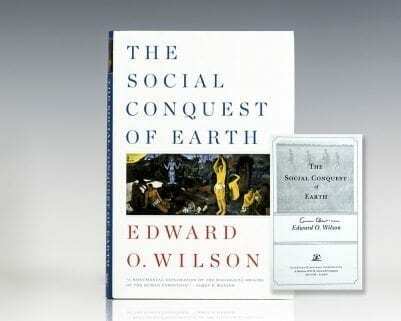 The novel tells the story of Friedrich Löwenberg, a young Jewish Viennese intellectual, who, tired with European decadence, joins an Americanized Prussian aristocrat named Kingscourt as they retire to a remote Pacific island (it is specifically mentioned as being part of the Cook Islands, near Raratonga) in 1902. Stopping in Jaffa on their way to the Pacific, they find Palestine a backward, destitute and sparsely populated land, as it appeared to Herzl on his visit in 1898. Löwenberg and Kingscourt spend the following twenty years on the island, cut off from civilization. As they stop over in Palestine on their way back to Europe in 1923, they are astonished to discover a land drastically transformed. A Jewish state officially named the "New Society" has since risen as European Jews have rediscovered and re-inhabited their Altneuland, reclaiming their own destiny in the Land of Israel. The country, whose leaders include some old acquaintances from Vienna, is now prosperous and well-populated, boasts a thriving cooperative industry based on state-of-the-art technology, and is home to a free, just, and cosmopolitan modern society. Arabs have full equal rights with Jews, with an Arab engineer among the New Society's leaders, and most merchants in the country are Armenians, Greeks, and members of other ethnic groups. The duo arrives at the time of a general election campaign, during which a fanatical rabbi establishes a political platform arguing that the country belongs exclusively to Jews and demands non-Jewish citizens be stripped of their voting rights, but is ultimately defeated.